Throughout our history, American patriots have fought and died for our freedoms and for their communities. This collection pays tribute to American history and some of its greatest heroes. The 2nd Amendment was created to protect the rest of the Bill of Rights, our Constitution, and our country from Tyranny and persecution like that imposed by the British Monarchy before the start of the American Revolutionary War. But over the years it has become even more than mere words. It has become a symbol in itself of America: our belief in Freedom and our will to protect those we love. In WWII, it was this symbol that inspired one of the best quotes of the century: "You cannot invade the mainland United States. There would be a rifle behind every blade of grass" whether or not it was actually said. Still, we believe the legacy of the Founding Fathers was clear with the intent of the creation of the 2nd Amendment: to Protect Freedom! 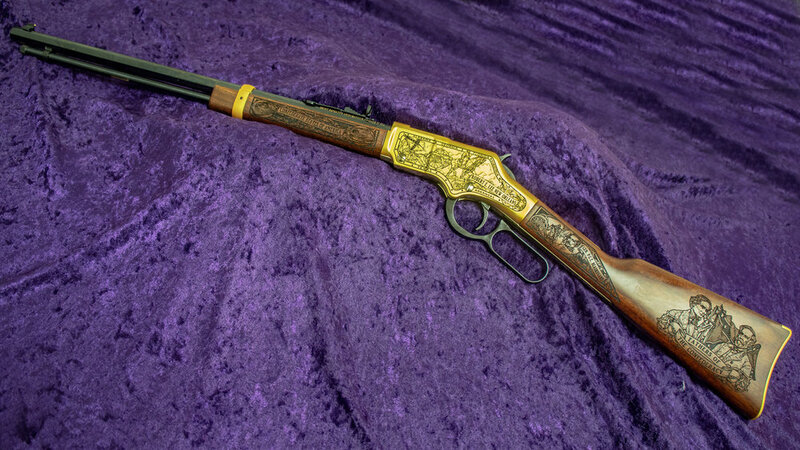 Only 10 numbered rifles will be engraved for each state with a 24 Karat Gold-Plated Satin Finish. Margaret Corbin watched her husband, John, take his last breath at the Battle of Fort Washington on November 16, 1776. But she didn't stand idly by. Margaret stepped into his spot and worked to load and fire cannons at British troops. As they charged the hilltop, Margaret sustained gunshot wounds to her jaw, chest, and left arm before being taken prisoner. Margaret Corbin exemplifies the resolve and courage of American patriots and we honor and all who have fought so valiantly for liberty in our country. There will be 100 numbered rifles made per state and built on a Henry Golden Boy .22LR caliber with 24 Karat Gold-Plated Satin Finish. The War Between the States divided not only our nation, but families as well. Many Confederate soldiers who felt a duty to their home states were often pitted against family members from the Union and many American lives were lost. More people died in the Civil War than any American war before it. Both sides lost many good men and the healing process was long. Confederate statutes were erected in the South to remember what happened and why. If we do not remember our history, we are doomed to repeat it. Heroes and Patriots is proud to celebrate the individuals who came before us with this specially designed rifle. This limited-edition item contains 11 numbered rifles for each state.